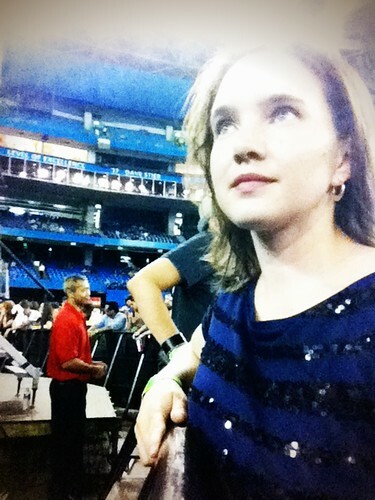 One month ago at this time, I was enjoying the opening song at the U2 show in Toronto. It had been a heck of a long time coming. It was way back in October 2009 that I bought my tickets for the show that was supposed to happen in July of 2010. It would be my ninth U2 show, having seen my first one in Melbourne in 1993. Then the 2010 North American tour was canceled and we added another year to the wait. But that wasn't all the waiting I did for the show! The day before the concert, I went down to the stadium to get myself a number from the fans who were watching over the line-up. Since I heard about the number scheme kind of late into the process, I ended up at #97. 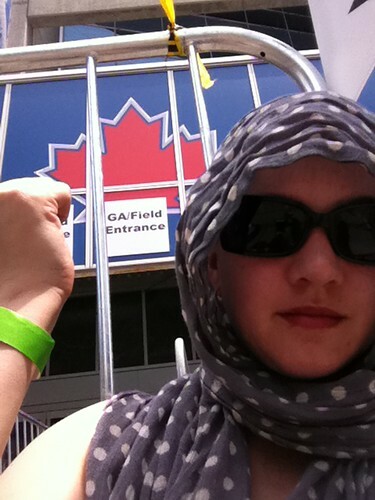 It was higher than I wanted but it is worth remembering that I was #97 in line for a show with 60,000 tickets sold. Monday the 11th, I had booked off as a vacation day. At 3:30 AM, I took a taxi back to the stadium, loaded down with a lawn chair, newspapers for reading plus food and drinks for the day. I needed to check in by 4 AM to keep my #97 number. 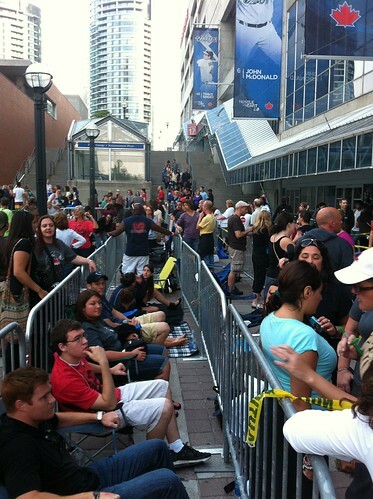 Even at this hour, there were over 100 fans settling in for a day on the pavement. I was there on my own because my regular U2 buddies (brother Ewan and friend Anisa) couldn't get the day away from work to spend in a concert line-up. I guess I am making this all sound pretty dire but it was a fun atmosphere, I swear! There were U2 fans from all over the world (every continent except Antarctica!) so lots of people to meet and chat with. It was a hot day, up to 32ºC plus humidity and the heat radiating from the concrete. I took it easy, read my newspapers in my lawn chair, applied sun screen, chatted with people, zoned out. I was interviewed by CBC TV about why people feel the need to line up for a concert (nobody saw that except Meghan, I hope!). At 1 PM, we got wrist bands from the security team and our line-up numbers were re-assigned due to some people not showing up. I was upgraded to #79! My goal was to get myself to the front rail right up against the stage. 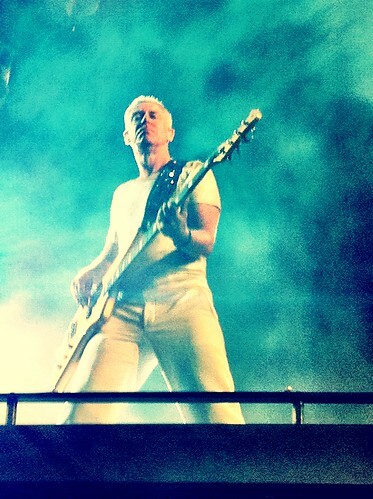 I had never been able to get right on the rail although I'd been one or two people back several times before. The fact that I was on my own would make it easier to get there, I reasoned. I thought this may well be the last chance I have to be 'on the rail'. Who knows what the format will be if there is another U2 tour? Maybe I won't have the same freedom to spend a day waiting like I did this time? I figured that this year, I would be all in. A little after 5 PM, the gates opened at last and we started going into the stadium. I ran down the stairs to the stadium floor as fast as I could given the crowds around me. When I got to the grass of the baseball outfield, I broke into a sprint and I was able to overtake a number of people. These are the critical moments that decide your positioning around the stage. We then had to run around the side of The Claw and under the circular ramp. From that point, I looked for an open spot on the rail. And I found one! It felt amazing to be right at the front for this amazing spectacle! 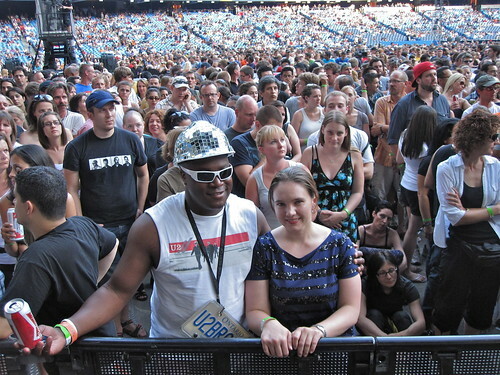 I happened to end up beside notable Toronto U2 enthusiast U2BROTHR, he of the mirrorball hard hat. The dome of the stadium had been closed all day because there was the threat of a thunderstorm. 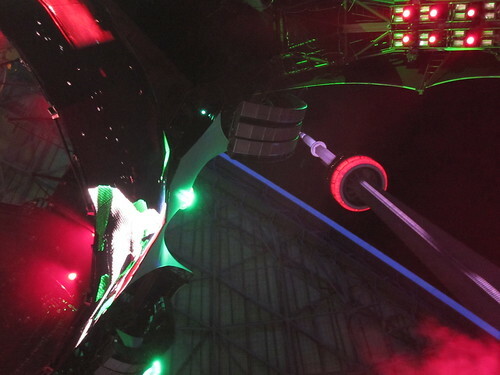 Everyone was hoping the roof would be opened because the sound would be much better and because the lights of the CN Tower would be adding to the show. 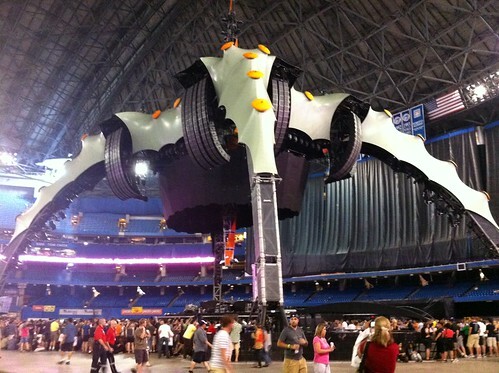 A little before the opening act started, the roof was opened up and everyone cheered! It was going to be a clear night! 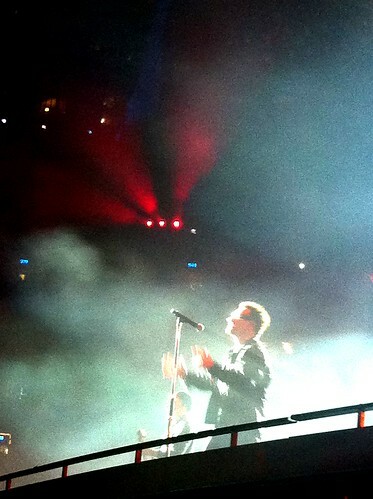 By 9 PM (a good 15 hours since I'd lined up), U2 was on the stage. The first song was 'Even Better Than The Real Thing': the familiar guitar riff had an extra note which gave it a super-charged quality. 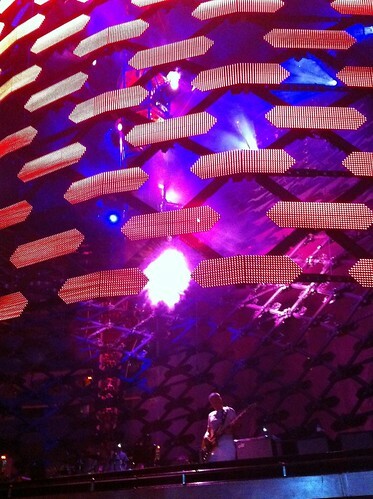 Standing right up against the bank of speakers as I was, each bass note made my heart bump and my rib cage rattle. You'll experience the music at a deeper level if you're right up front. The Globe &amp; Mail had good things to say about the night. At dusk, the bright, full moon was set just above the rim of the stadium as Bono sang, "Johnny, take a walk with your sister the moon, let her pale light in to fill up your room". It was kind of perfect. I won't go into a song-by-song review of the show. I was thrilled, however, to hear a couple of my favourite U2 songs performed for the first time in my experiences. Zooropa was the big delight for me. 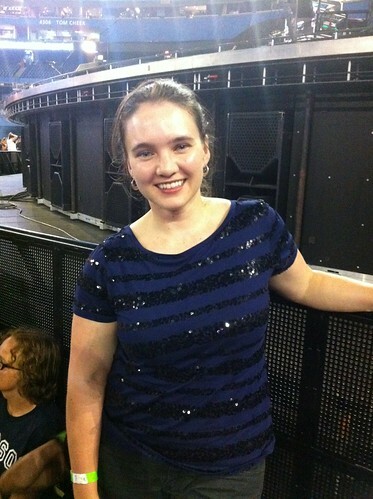 I had successfully avoided set-list spoilers (yes, even concert tours have spoilers now!) so I was not expecting it. Bono sang this one song quite flatly that night, I thought, without the teasing manner from the recording, but the instrumentals and lights were great. I was also really excited to hear 'Hold Me, Thrill Me, Kiss Me, Kill Me' for the first time. This song had an elaborate staging involving dry ice generators being wielded by two men in gas masks. It must have looked better from a distance because from my position, the effect was lost. Here is how this would have appeared from a normal vantage point. Although I saw three shows from this same tour in 2009, it was worth seeing the show again in 2011 as there were a number of changes in the program. The set-list was notably different with far fewer of the newer songs being performed. In terms of the special themes touched on during the tour, there was one important development: in 2009, the song 'Walk On' was dedicated to Aung San Suu Kyi every night in what was one of the most touching parts of each show. Now, she is a free(r) woman. For 2011, The Lady herself recorded a message to preface 'One'. I thought that was pretty amazing. I have to say that although the show itself was excellent and I was thrilled to be right at the front, I don't think I'll remember this night as well as some of the other U2 concerts I've been to because I didn't share it with friends or family. Being there with my favourite people makes the biggest difference! Yeah, front row is THE BEST! I kinda love the crush of the people and the ocean wave sensation being smooshed with a ton of people all excited just like you are!